Windows Vista Brute-Force Keygen creator “Computer User”, once a self-claimed Windows Vista enthusiast, has turned it a joker and cheater instead, by disowning the Vista Brute Force Keygen algorithm script that he created, claiming that the crack is a fake will not work, and encourage Vista users to use other cracks such as softmod ISO, Paradox OEM BIOS Toolkit and TimerLock. Apparently, the keygen program does legitimately attack Windows Vista keys via brute force, but the chance of success are too low to be used as a practical method. 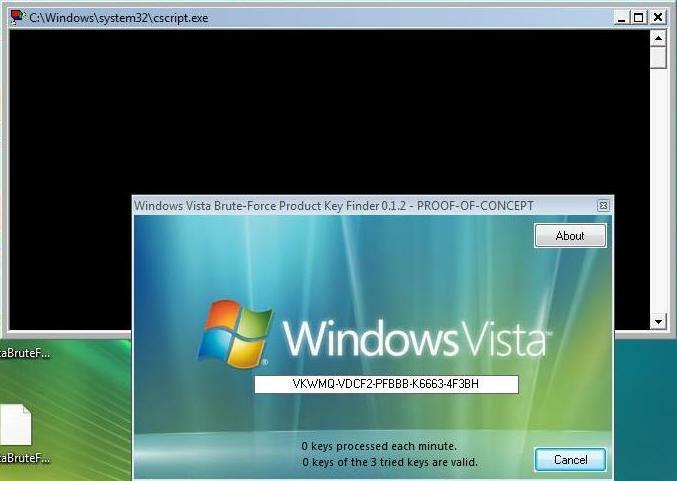 However, if you still believe about the idea to randomly brute force guessing a valid usable product key or serial number for Windows Vista, another hacker “stof91” has developed a graphical user interface (GUI) to the Vista Brute Force Keygen, which make the whole guessing and key calculation process as easy as a few clicks. Vista Brute Force Method GUI 0.1 is a small tool that incorporates the same method and algorithm that Vista Brute Force Keygen used, where the process guess and try all possible combinations of 25-character Windows Vista product key one by one by capitalizing on Windows Vista built-in product key recognition and authentication process that needs not contact with Microsoft’s server, until it get a product key that is usable and accepted by the system and in an acceptable format. The utility also enhance on the Vista Brute Force Keygen patch slmgr.vbs script to make it less resource hungry, and verify each generated key for validity. Thus it can only process about 240 keys/hour. If you’re using any edited slmgr.vbs (including the one from Vista Brute Force Keygen), restore to the original Microsoft version. Download the VistaBruteForceKeyFinderProofOfConcept.rar archive (version 0.1) and extract everything inside the archive content to a folder. Right click on the VistaBruteForceKeyGUIProofOfConcept.exe executable, and select “Run as Administrator” from the right click menu. Click on Start button to start the brute force guessing process to hack and crack to get a product key. Note: If you place a dummy slmgr.vbs in \Windows\System32 folder in Windows XP, this program will work too, but it won’t find any product key as there is not validation system for the product key generated. Wait for some Windows Vista product keys to be generated by the keygen (key generator), the waiting time is anywhere from a few minutes to may be a few months or even years. During the process, many empty command prompt windows will be opened, just ignore them. Once any legit product key is found, the KeyGen GUI will pop up a dialog box on the screen, and also log and write the serial CD key into a text file located on the same folder with the GUI executable, where you can check for time to time. Once a product key is found, try to activate Windows Vista with the following SLMgr command to see if the product key been accepted by Microsoft activation system and able to pass WGA validation process. The VistaBruteForceKeyFinderProofOfConcept.rar archive also contains the source code inside the source folder where you can study to understand what’s the concept been used. However, bear in mind that cracking Windows Vista product key is criminal act. (Hope that providing information is not though).